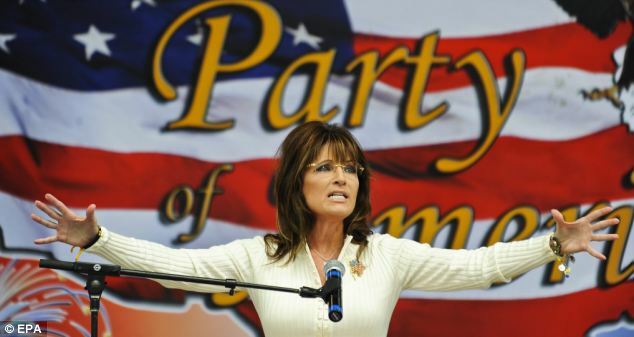 Sarah Palin spoke at the 'Restoring America' Tea Party rally in Iowa earlier today. When she walked on stage, the crowd began to chant, "Run, Sarah, run!" and they chanted it again after she had finished her remarks. No, she didn't announce her candidacy for POTUS but she did outline her plan to fix our economy. Her speech sounded and looked like a campaign stump speech and I don't pretend to know or understand why Palin hasn't proclaimed her intent to be a candidate. After her forty minute speech, she descended the stairs and walked the rope line for forty-five minutes. She's a natural with the crowd and one could sense their affection for her as she walked down the line talking to them, standing for pictures and signing just about anything they put in front of her. In 2008, during the Presidential campaign, Sarah Palin came to my town and I was one of 10,000 people there to see her that day. When the event coordinators sent me up into the stands my friend, Bruce, made sure I was on the main floor instead. I was in the front row of the rope line that day almost directly in front of the podium where she delivered her remarks. When she had finished speaking, she walked the rope line and when I shook her hand I said, "Tell John McCain he needs to fight." She replied, "I will." Well, McCain never did fight for the presidency nor for our country in 2008. He never fought against Obama either but Palin did. Regular readers of this blog know that I am a huge fan of Palin and I want her to be the candidate to run against Obama. She has said that by the end of September she will make the decision as to whether or not to run in 2012. When she finished walking the rope line in Iowa today she walked up the stage steps, waved at the crowd, turned her back to walk backstage and the crowd started to chant, "Run, Sarah, run!" Big Government has an excellent review of her speech here. Pictures below are from the article about this speech in the UK Daily Mail.